There’s a new visualization on the block, and it’s called a word cloud. Well, okay, it’s not that new, but now you can EASILY create your own! We have one on the side of our blog to help you browse our content, del.icio.us does something similar, as do many other sites. Today, though, I’m talking about using word clouds to define things – concepts, terms, your personality, etc. Much more interesting and engaging than a one-sentence definition, word clouds will make your audience “ooh” and “aahh” and hopefully remember what you’re talking about. Our tool of choice? 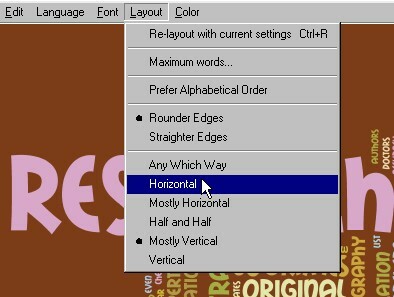 Wordle (http://wordle.net). If I’m trying to “define” a term or concept, I’ll often use a ‘define:’ Google search to gather some text, as in “define: peer-reviewed“. Wikipedia might be another good source for text to define something. For this example, I’ve gathered text from .edu sites that list characteristics of scholarly articles. You’ll want to do some basic editing of your text. Wordle will remove stop words (articles, etc.) but you might not want the term you’re defining to show up in your word cloud or URLs or other non-related terms that don’t add anything valuable to your definition. To do this, you can copy & paste the text into Word or Notepad or some other word processor. (Hint: Find & Replace will save you some editing time.) The text doesn’t need to be gathered in any neat organized fashion; Wordle will do the work for you. You need to go to Wordle and click “Create” – ’cause that’s what you’re gonna do! 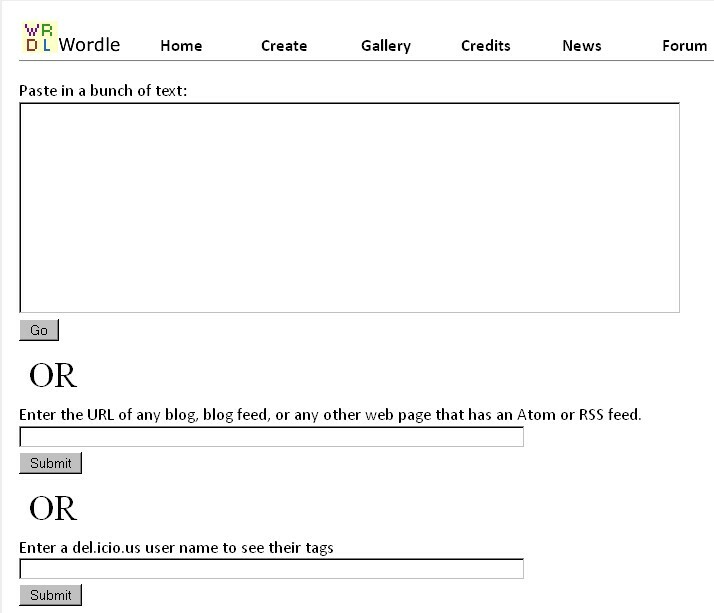 There are a couple options for getting text into Wordle – you can link to a certain URL or a specific del.icio.us user. Since we gathered all this text, though, we’re going to “paste in a bunch of text”, like they suggest. Copy and paste your assembled text (Ctrl+C, then Ctrl+V) and click “Go” to get your visualization. Your text doesn't have to be well-organized. Just paste it in there. Wait for your visualization to appear (it may take a few moments). If all goes well, you’ll be presented with a stunning visualization of all that boring B&W text you collected. If it’s not so stunning, hit the randomize button or use the menu options to customize your visualization. You may also find that a certain word sticks out like a sore thumb and you’ll want to go back to remove it (or at least reduce it’s frequency to make it smaller). My sparkling visualization. 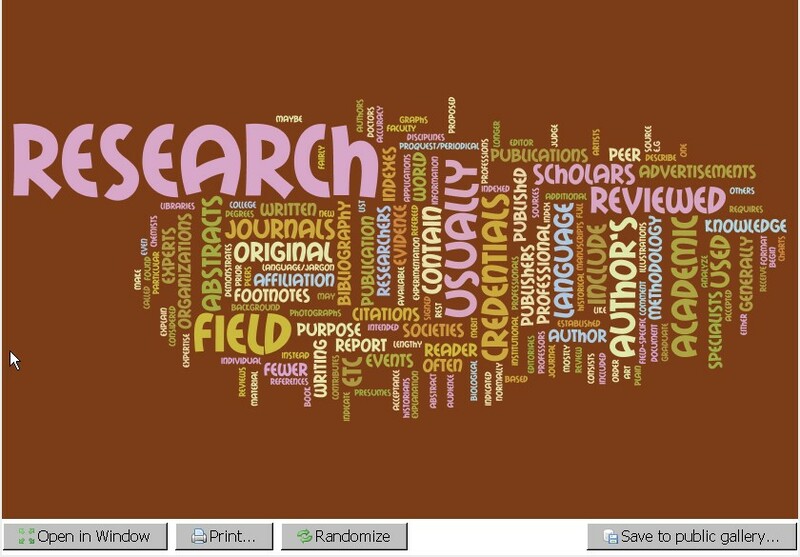 Use the "Randomize" button to get a different version of your word cloud. You need to get your visualization out of Wordle and into your presentation. Use a screen capture program or the old school “Ctrl+Print Screen” method to take a screenshot of your visualization. I’d recommend the fantastically free Wisdom-soft ScreenHunter for this task. Once your visualization is saved as an image, you can use it anywhere you please: your website, a presentation, or for wall art. Just make sure to give Wordle there due credit! A library in Autrailia apparently made signs out of their word clouds to show what goes on in the library.